It's just a simple gathered rectangle attached to a loosely fitted bodice, which I thought would not interrupt the fabric print too much. 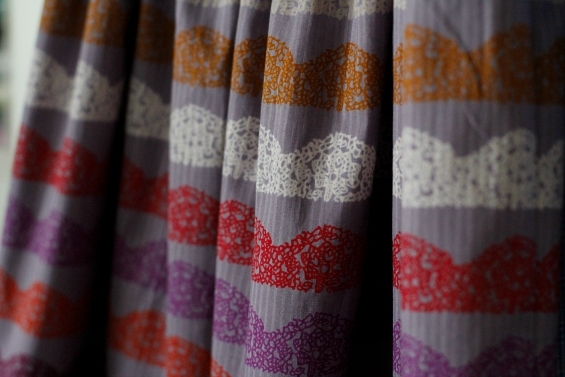 The fabric is a light polished cotton with a woven stripe running through it. I underlined the skirt portion in a thin cotton poplin to stop any transparency issues, which is why it's sticking to my stockings in these photos. There's not much to say about this pattern really, because it is very simple. I left off the hem band and just cut the skirt portion long enough to fit me with a decent hem. I also forgot to put those inseam pockets in before I sewed the side seams and was too lazy to unpick and put them in, which I'm sure I'll regret because pockets are always handy. I do like that the skirt is gathered before it is sewn to the bodice, and then it's further cinched in by elastic because it means that the bodice isn't as blousey as it would have been without doing it this way and it avoids the need for a zipper. But I didn't particularly care for Burda's instructions to sew the elastic to the seam allowance at the waist line - you have to use quite narrow elastic and it makes the seam allowance dig into the body a bit and cause a bit of ridge at the waist line. If I were to make this again (or undo this and remake it) I would make the seam allowance bigger and sew down the seam allowance to the bodice to create a casing for elastic to be inserted into. And most of all I'm impressed with myself for sewing up fabric within a week of purchasing it - it doesn't happen all that often I must admit! 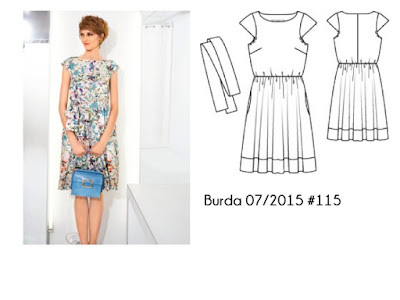 Those of you that have been paying close attention may have noticed that I haven't posted a Burda of the month project for the last, oh, 3 months. I got very annoyed because the May issue didn't arrive until June 1 and was then followed the very next day by the June issue - both landing in a very busy month which I didn't get a chance to sew anything from them. And then to top it off the July issue arrived on June 30 - that would be 3 months worth of Burda in one single month. I'm part way through making my project from the May issue, but I'm having some annoying fit issues that I'm still contemplating the best way of fixing. So I decided to skip forward to the June issue and make a rather simple top, since nothing else really caught my eye. Funnily enough for a pattern made of two pieces it gave me just as many fit issues as any complicated pattern. If you are a sewing purist that appreciates fine finishes and proper techniques you may want to stop reading now - because between the unsophisticated pattern design and my dodgy fixes this is not my finest moment. Let's start with how bad the pattern is - I should have known from the outset that it was going to be all sorts of wrong. It has only one pattern piece - the front and back is the same, and it is cut on the fold. But I'm not the only one that had this problem - there is a version on the Russian burdastyle website that looks exactly like the one I've made, although there are two other versions that don't seem to have the problem. I didn't cut my v - neckline as deep as the pattern was designed, so I don't know if that has caused this, but at this point I knew that this was going to be a wadder. The Burda pattern instructions instruct you to leave the neckline raw, but use a binding strip for the armhole edges which struck me as very strange because the fabric suggestion is for silk satin (view B is for a knit) which would surely unravel and look terrible. 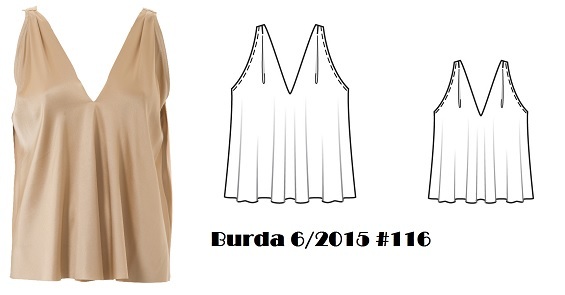 Surely Burda could have drafted a facing for the neckline? I tried tucking it in and hiding it beneath a jacket, but that defeats the point of a lightweight, drapey top doesn't it? My humble opinion - I do not recommend this pattern at all. I like the pleats at the shoulder and the overall idea of the top, but that neckline is just lazy drafting and I'm pretty sure you could find a better pattern for a v-neck top with draping. I just don't think an easy pattern needs to be this poorly designed. But the good thing about my Burda challenge is that it forces me to try something different sometimes, and nothing has been lost but a bit of stash fabric and a few hours of my time. Onwards and upwards for the next project I say. By the way it still is bitterly cold here in Sydney, I've just cranked up the heat to take these photos! It's been so chilly here in Sydney lately that the single digit overnight temperatures have made the 6pm news (apparently we're in a polar vortex) and prominently in our major metropolitan newspaper. In the part of Sydney I am there hasn't been any frost let alone snow, and during the day it's been sunny with temps between 15 - 18C so life has continued on as normal with just an extra coat to go with the sunscreen and hat! It seems that us Sydneysiders in general just cannot cope with the cold. Myself as well - I've spent far too many nights recently curled up on the lounge under a blanket with hardly any motivation to venture in to my sewing room, hence the blog silence of late. But as they say in the business, here's one I prepared earlier! Back in May I had a weekend away with my Australian Sewing Guild group which was not only lots of fun but also quite productive. I made this cowl neck top from Kwik Sew 3740 on the first night, and it took about two hours from cutting out to finishing because it's such a simple pattern and I made it mostly on the overlocker apart from twin stitching the hems. I had been planning to make this for such a long time after seeing lots of lovely versions around (see Sharon , Kyle, Shannon and Sue) - I have no idea why I took so long to get around to making this one. It won't be the last one though. The fabric I used is some type of wool knit that came in a big tubular piece but it's exact composition is unknown because I bought it for a bargain price at the Fabric Cave at Meadowbank last year (a charity shop selling donated fabric and other craft materials for those not familiar with the bounty that is the Fabric Cave!). The fabric pressed beautifully, is not too scratchy and is the most wonderful deep shade of red. The neckline is exactly as wide as the pattern envelope shows, so that wasn't a surprise but I wasn't expecting the shoulders to be so wide - the seam line is so far off my shoulder it's almost a dropped shoulder. That cowl is quite big and it does need to be carefully arranged to sit properly otherwise it looks like a scrunched up mess, but it would probably sit a bit better in a more slinky knit. 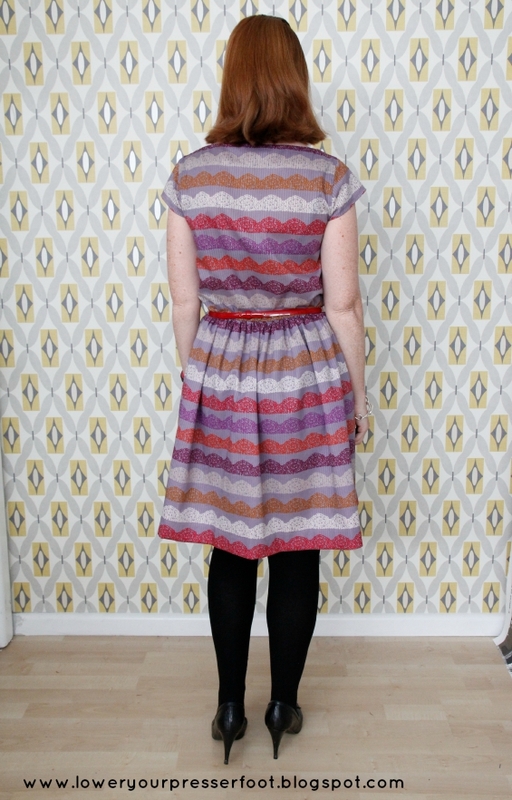 My verdict: this is a great pattern with Kwik Sew's usual precision drafting. Their patterns may have the most boring cover envelopes, but they sure are reliable when it comes to proper drafting. For my next version (and I'm hoping that will be sometime this winter) I think I will try to raise the neckline a little because it's a bit too cold to have that much chest area out in the cold air!